TEA PARTY DOWNGRADE? – The message from the White House was mixed over the S&P downgrade of the nation’s credit rating. The two main talking points are at odds. Talking point one: This does not really matter; it does not affect the nation’s ability to sell bonds. Talking point two: The “Tea party downgrade” is catastrophic for the nation. In other words, Obama’s position is that the downgrade doesn’t much matter unless we can blame it on the Tea Party. MARKET VOLATILITY – The failure of President Obama to make any statement for several days after the S&P downgrade of U.S. Treasuries caused some serious volatility in the markets. This volatility was not caused by the actual downgrade, but by the uncertainty as to the reaction of our government. Finally Chairman Bernanke calmed markets by promising that the Federal Reserve would continue to lend money to major banks at 0% interest rates at least until March, 2013, well after the next presidential election. This proved that the market slide had less to do with the downgrade than with the deteriorating financial situation in the West. All of Western Europe and the United States have been floating giant entitlement programs and free medical care with borrowed money. Much of that borrowed money was just flat out printed. There is not enough real money in the entire world to pay back what Europe and the USA owe. 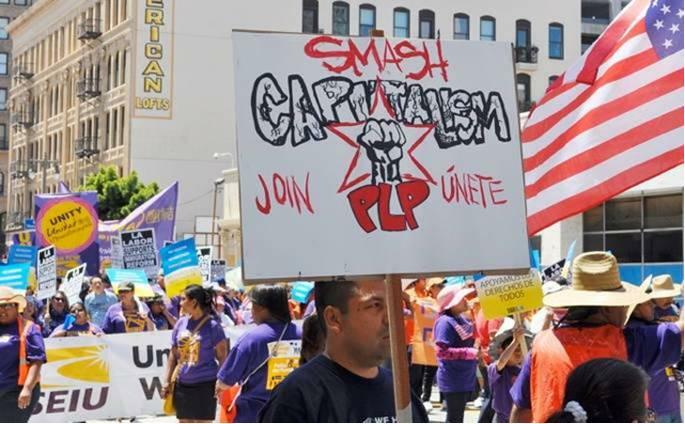 SEIU DISPLAYS COMMUNIST LINKS – The 2011 May Day parade in Los Angeles featured all the pro-Obama groups, including the Service Employees International Union which gave him $28 million in the last election as well as the Communist Party. SEIU members carried communist flags and called for communist revolution from “Wisconsin to Libya.” A short clip of the pro communist SEIU marchers during the parade is located at YouTube. THE LONDON RIOTS – The London riots, which have spread to other cities in the U.K., are actually Twitter driven events. Under employed or unemployed young men are using Twitter and other social media to arrange mobs to sack stores. The core reason for the looting and violence is the cutoff of much of the money the U.K. handed out for decades for unemployment and social services. Now nearly broke and with bond sales nearly failing last year, the government has made huge cuts in entitlement spending. Similar mob violence and looting has occurred in Greece. The demonstrations and riots that led to the fall of the Egyptian government this year had far less to do with democracy than with the rise of food and fuel costs when that government lowered subsidies. The problem is simply this: World governments can no longer afford to borrow money to supply cradle to grave services to residents. CHAIRMAN’S REPORT FOR AUGUST 12, 2011 – William Murray’s newsletter, the Chairman’s Action Report is now available online. This issue contains insights into White House actions before and after the downgrade of U.S. credit. Also featured: Obama’s birthday bash that cost more per plate than the average American makes in a year. Why the atheists are suing the Ground Zero museum. More on the Ground Zero mosque, now called “PrayerSpace”, and yet another attempt at jihad at Ft. Hood. RAMADAN BODY COUNT – As of the 12th day of Ramadan there have been 50 Islamic terror attacks, with a total of 121 killed and hundreds more wounded. TheReligionofPeace.com keeps a daily body count of victims each year during Ramadan. Islamic assassinations, mass murders and riots often peak during the “holy” month of Ramadan as imams poison the minds of men virtually every day rather than just on Fridays. The site has links to stories from all over the world of Islamic terror attacks that are not reported in the United States, stories like the one that follows. QUEEN ELIZABETH WILL WEAR THE HIJAB – London Islamist Abu Waleed: “We Will Make David Cameron Get on His Hands and Knees and Pay Us the Jizya Tax; Queen Elizabeth and the ‘Whore’ Kate Middleton Will Wear the Niqab” See the actual video!